The Serie A is dominated by Juventus, Serie B is just one step away from losing to Juventus so why not dig deeper and go Serie C and to a beautiful little town called Lucca. The local team Lucchese will look to topple the greats. 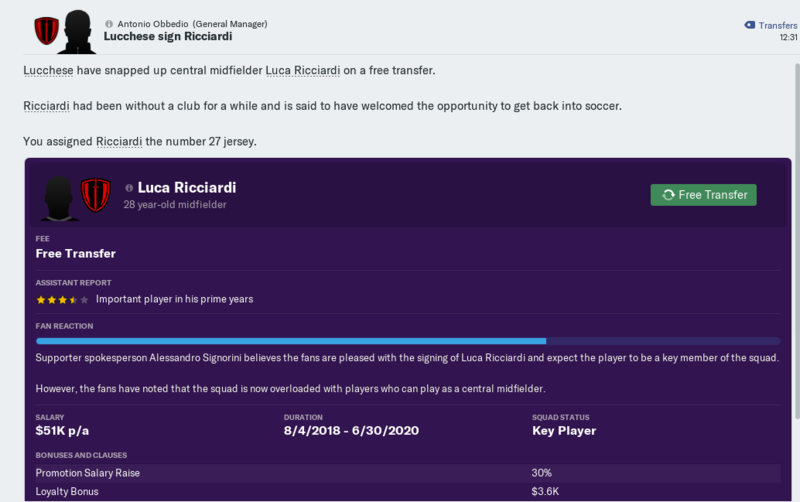 Ciao Everyone and welcome to a story that goes deep into the Italian leagues at a beautiful town called Lucca. Just an hour and ten minute car ride to Florence and a twenty five minute car ride to the Leaning Tower of Pisa, this gem of a city had caught my eye in real life before becoming inspired to bring their club to glory. 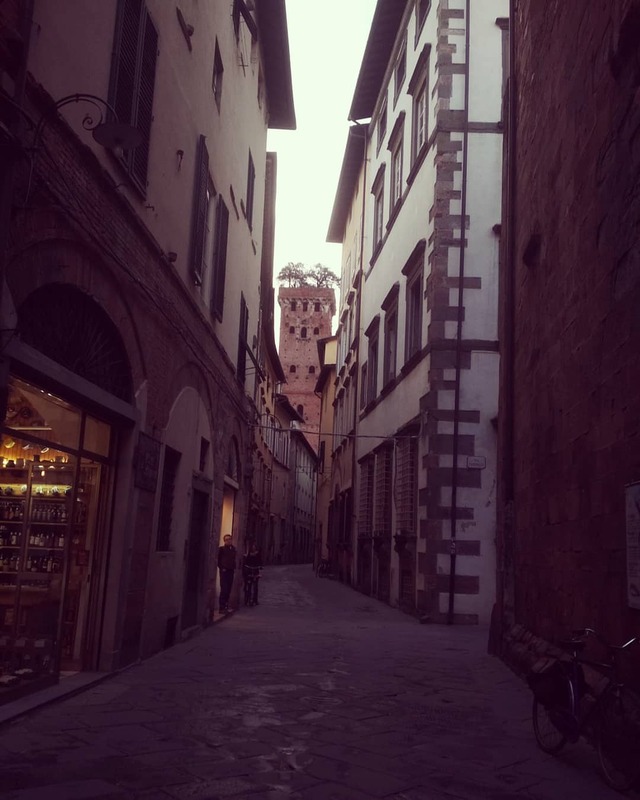 I will be purchasing a small townhouse inside of the city of Lucca in the historic city center; for those of you that are unfamiliar with Lucca, the centro storico is completely surrounded by ancient walls that protected the city. For those of you who have never seen this city or its walls; a quick google search will do wonders. My townhouse is located near Piazza Napoleone where it will be a 6 minute car ride to Stadio Porta Elisa or if I feel like strolling through this ancient city a loving 20 minute walk taking me past the Torre Guinigi and other beautiful landmarks. I cant wait to start this exciting journey with everyone! Andiamo! Working on finding a site to upload images so I can have them directly in the feed. If anyone has any suggestions please let me know as I haven't done this since Football Manager 2015! Use Imgur, its the tab/button with the big I on it. An early season update from Lucca! I was officially announced as the Lucchese manager today and I have to tell you I am truly excited to get this journey under way. I have settled into the city well and although some might think its a risk living right in the city, constantly having the fans around; I want to be immersed in everything this city and its people have to offer. Season expectations to finish mid table are acceptable. I honestly think we could make playoffs but I am not entirely convinced that we would secure promotion. The first bit of action saw us get drawn into a two team group for the Serie C Cup. I have zero knowledge of any other club in the Serie C so everything will be a crapshoot and learn as you go experience. 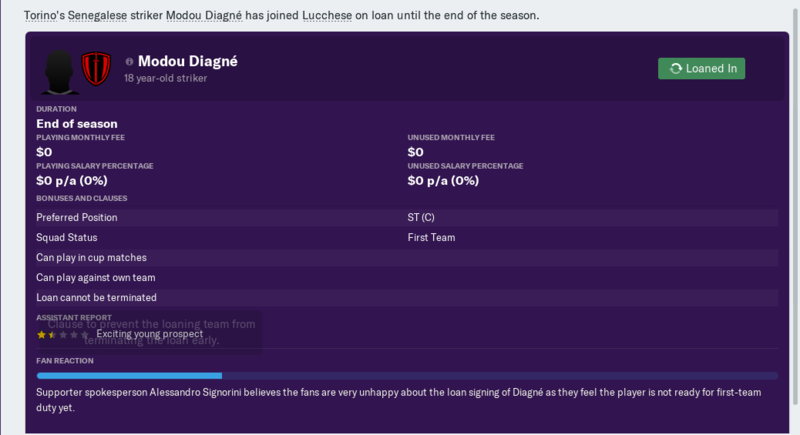 My first signing as Lucchese manager, I looked at the squad and realized I needed to secure a right midfielder and this became my priority. Not something you want to see as a new manager, depending on who the new president is of course. On the positive side, maybe more money; on the negative side potentially out of a job before I get started! Our first two competitive games saw us win both, I was delighted with the team and the effort. We look forward to taking on the next round of the Serie C Cup. If the Italians are known for anything its their drama, and unfortunately there is no shortage of drama here in Lucca. I am hoping this will get resolved soon! As I stated earlier, our chances of promotion are slim but as long as we finish in a respectful position I will be more than contento. This is a huge moment already in my insignificant career. This takeover could be the water that I need to help this team blossom or it could be the end of my road before I've even left my house. Couldn't be happier with what I have seen so far from this group of players. We will continue to work hard and fight for a chance at promotion but it is still early days and we cant get ahead of ourselves. When we last left off Lucchese were flying high in the Serie C, grabbing results we probably shouldn't have been able to get and doing well in the Serie C Cup. Since then we have had to make a few adjustments to try to keep on track with promotion but I dont want to spoil too much without showing everyone some pictures. Going into this match we had been struggling as a team to find our identity. We were on a four game losing streak and that's when I made a drastic decision to change our formation. We had been playing a 4-4-2 with some wing play and we weren't getting the possession I liked or the attacking chances. We switched to a 4-3-3 and this was our first game using the formation on just four days of preparation. Needless to say I was quite nervous going into the game but the lads were able to pull it off and get us into the third round. 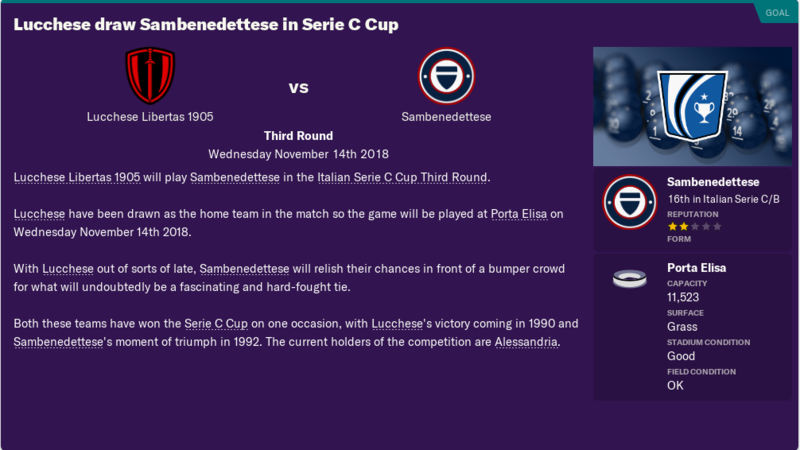 Having drawn Sambenedettese, a team which I was not completely familiar with, and starting to turn the results around in the league; I was feeling quite confident about our chances. We struck first in the 33rd minute only to give up a goal in the 34th. Tied at half time I encouraged the guys to play better and they responded magnificently; especially my newly promoted starting forward Andrea Isufaj who finished the night with a hat trick. We won the game 4-2 and couldn't be happier with the change in tactics and the response from the team! For the quarterfinals we drew who I consider our fiercest rival, not even an hour away and a team we had already met once this season in league. We dropped that league game 1-0 at home so you could imagine I was quite nervous heading into this game even though we were home again. The crowd responded magnificently getting the players geared up for the game and it showed when our attacking left midfielder De Feo struck in the 2nd minute. It was a nervy game from there on out and I wasn't completely sold that we would be able to hold on. Fortunately, luck was on our side and we only needed the one goal to advance to the semifinals. 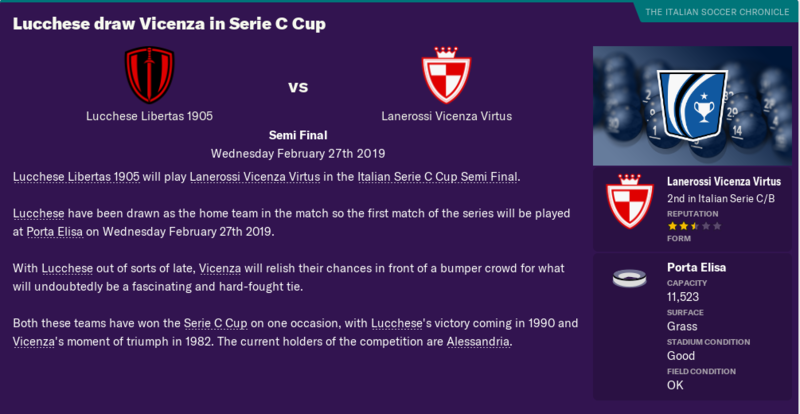 In the semifinals we will play Vicenza, we have been drawn as the home team which is something I am extremely pleased about. 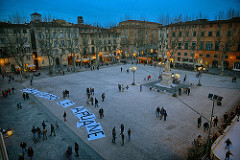 The buzz around the city for the game has been remarkable and we seemed to have brought new life to Lucca. 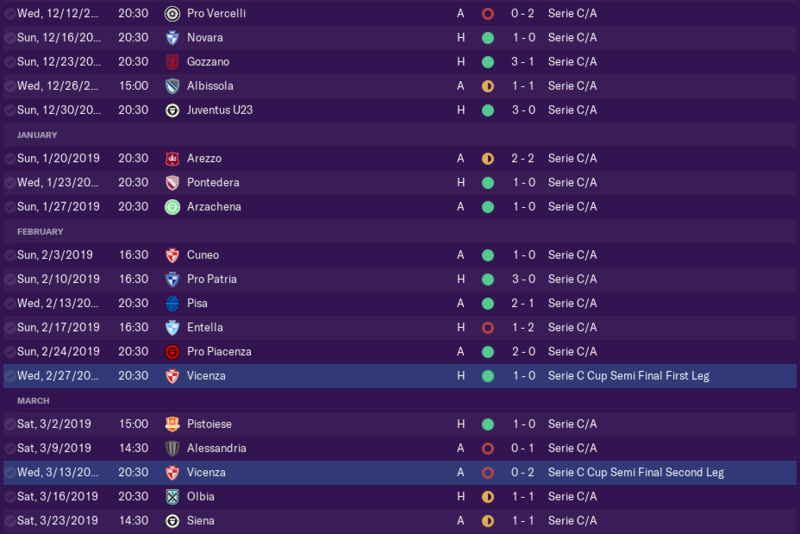 Everything in the Serie C Cup seems to be going right so far and we will have to wait and see what this match has in store for us. This was a big step for me and Cardore as he has been extremely disappointed with how the season was going when I first got to Lucchese. I brought in a midfielder which he felt was replacing him and demanded a move. I tried to talk to him but it only made matters worse, and with our 4-4-2 formation he was barely getting the playing time he wanted. 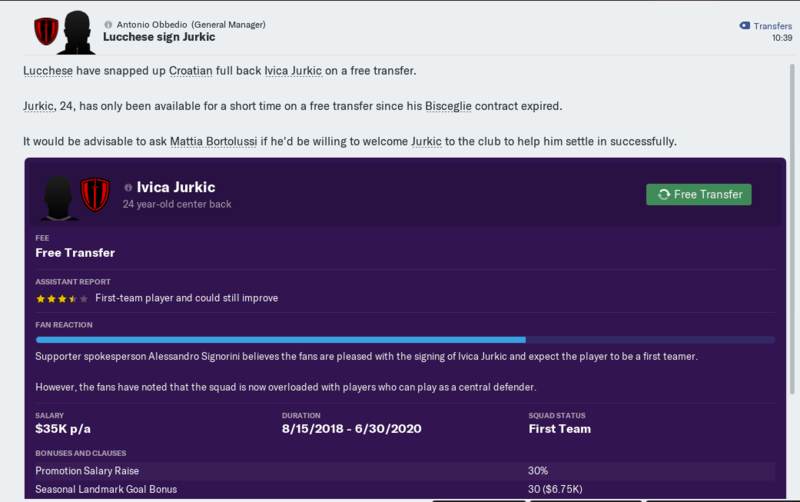 Once we switched to the 4-3-3 a spot opened up for Cardore to get some more time and he has since been happy, and honestly it has been a weight off of my shoulders as well. He even picked up a goal recently! You can see the poor run of form that we had in the league, four defeats in a row was making me nervous and the players were becoming discouraged. It was hard to show my face around the city without someone coming up and asking questions about the problems we were facing. I sat down with my assistant coach and we discussed some tactics over vino and decided it was time to make a change. We were struggling to hold possession at around 33% so we changed formation and our mentality. We decided on the 4-3-3 with a control possession style and we have seen a fantastic change in the players. Still too many draws for my liking but that may be something we have to address in January when pursuing a new forward who can put us over the edge. This season has been really enjoyable and I hope you all are enjoying it as well. A friendly reminder that the story is much more enjoyable if you all participate with questions or comments as right now it just feels as if I'm talking to myself. Anyway I have an update for you all so you can see how the season is progressing! 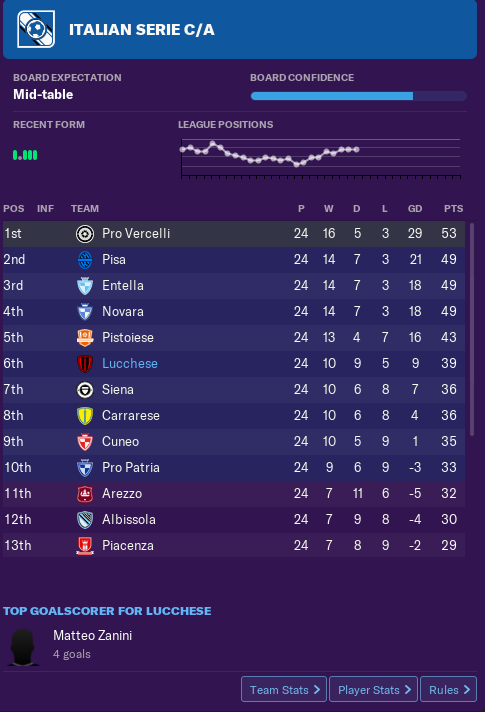 We were around mid table when we had to take on Novara which as you can see from the last update was toward the top and potentially fighting to be league champions. We were able to pull off an upset which kick started us on a nice little run. The continued success with the new formation has been a blessing, I am enjoying the possession much more and it honestly has been a huge relief for myself and my staff. 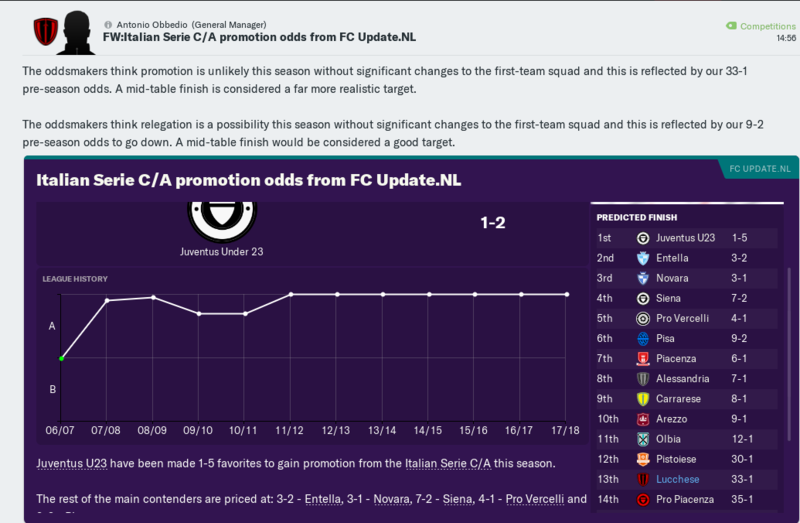 The January window came and I wanted to do some cleaning out because we were struggling to turn a profit and some of the contracts we have here at Lucchese are way too high for a Serie C club. So I decided to start with the players who were wanted by clubs and then moved on to some of the players that I had not used or barely used all season. We were able to alleviate some of the financial pressure but this is something I really want to lock down when I get to the summer transfer window, assuming I am still manager at that time. Aiolfi had asked to terminate his contract and he was our backup keeper barely getting any minutes and I knew it was detrimental to his career that he move on and be successful elsewhere. Juan had just started to break into the first team and with the new 4-3-3 system he was really making a home for himself in central midfield. When I saw the wages he was on I had to get rid of him, although I told him he would be welcomed back at any time to the club. 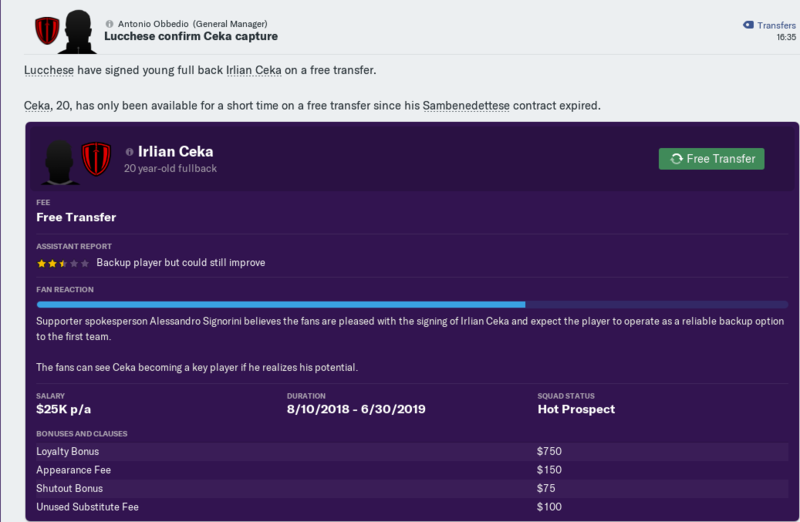 I hope this sale doesn't come back to bite me as he was my only central midfielder who had a ball winning mentality. As we all know when some go out, we have to bring some new faces in. My goal was to bolster some of the problem areas for us which I had pinpointed as forward as we were lacking scoring goals and a backup goalkeeper since we had just gotten rid of our only other goalkeeper aside from our starter. With those two pieces of the team in mind we went to work searching for some younger talented players that can grow into the club. I was able to find Cancelli on a free transfer which was perfect as he looks like a hard worker and wont complain much riding the pine, only time will tell. With time running out on the transfer window I was still in search of a forward and I was able to find a young Senegalese player who I could loan in from Torino. Some of the fans aren't to pleased about the loan but the positive is that we aren't paying any of his wages and I am sure that he will help us toward our goal of playoffs and potentially promotion. As I was waiting through the majority of the transfer window it occurred to me that my scouts were taking a long time to get information back to me. I took a look at my scouting staff and noticed we had no chief scout, I immediately put in a search for chief scout so we could be more effective finding players who will help the team. Within a week or so we had many eligible candidates who we took a look at closely but eventually settled on Orano Rolfo. I knew he was the man to lead us forward but I was nervous that the board would reject bringing in a chief scout. Luckily they agreed we needed one and we welcomed Orano to the club with open arms. As you can see with the change of formation and tactics as well as bringing in some new faces, we have settled in quite well. We are pushing the envelope and hoping that we can continue a good run of form so that we can earn promotion. If Lucchese are going to get to the next level they will need your support! 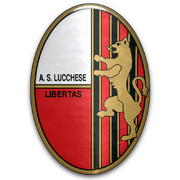 Ciao Amici; today we wrap up the season and see how our boys at Lucchese did in their push for a playoff spot. 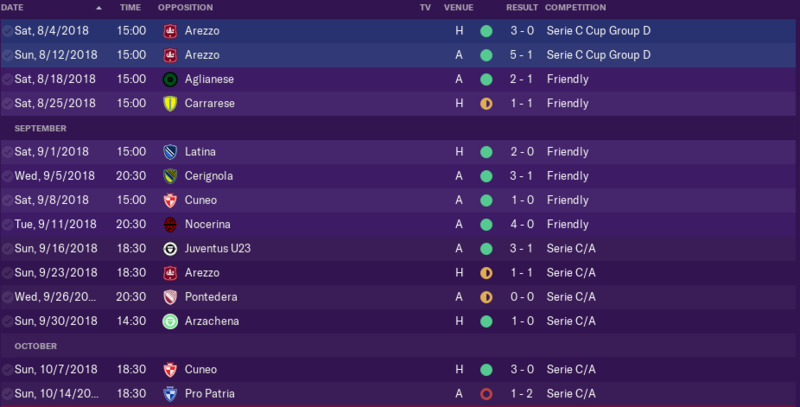 We set a new club record with a 10 unbeaten streak which was nice, this helped propel us all the way up to 4th at one point, giving our biggest rivals; Pisa a run for their money. We were riding a high but as all good things must come to an end, an end they certainly did come to unfortunately. We were able to grab a huge win over our fierce rivals and boy did it feel good to put them in the ground. They have been in front of us all season but we are definitely the better team when playing them head to head. Hopefully we will be able to continue our dominance over Pisa and keep our faithful fan base happy. The board has been pleased with what I have been able to do with the team and they have opened contract talks with me. I am extremely excited to be staying here in Lucca, it is my home and I want to bring the small city glory. It might be small steps, but they are steps in the right direction and I suspect we will work out a deal soon. As I stated earlier all great runs come to an end. 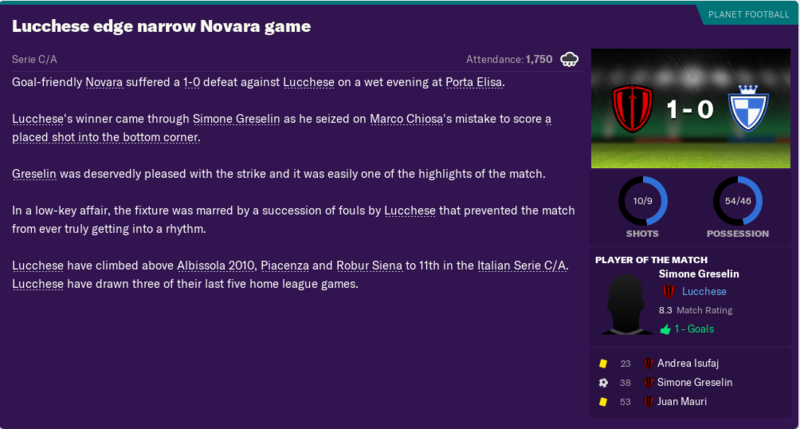 We had something really special going on in the Serie C Cup and we won the first leg 1-0 at home but fell short in the second leg. As we were headed into the game the team knew we needed to take care of business but our front line was unable to convert chance after chance and soon it felt like defeat was inevitable. We will pick ourselves up and look to improve in this competition for next season if we remain in Serie C.
With time running out on the season we fell into one of the hardest parts of our season. The team was feeling fatigued and squad rotation was necessary with the congested schedule. This proved to be costly toward the end of the season and after out 10 game unbeaten streak we were only able to win four out of our remaining eleven games in Serie C. Our forwards have struggled mightily and we will need them to be better going forward for next season. Luckily our good run of form during the middle of the season allowed us to qualify for a playoff spot. 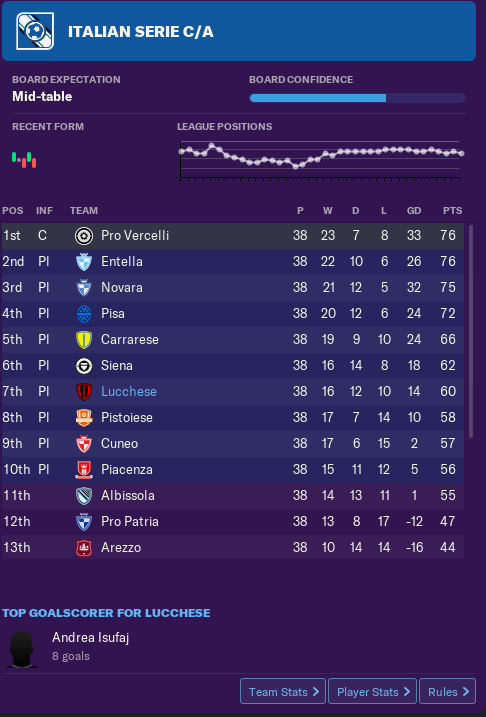 We will need to dig deep going into playoffs and hope for a good run of form so that we can hopefully sneak into Serie B but I am not going to hold my breath. At the end of the day we did come to an agreement for a new contract. 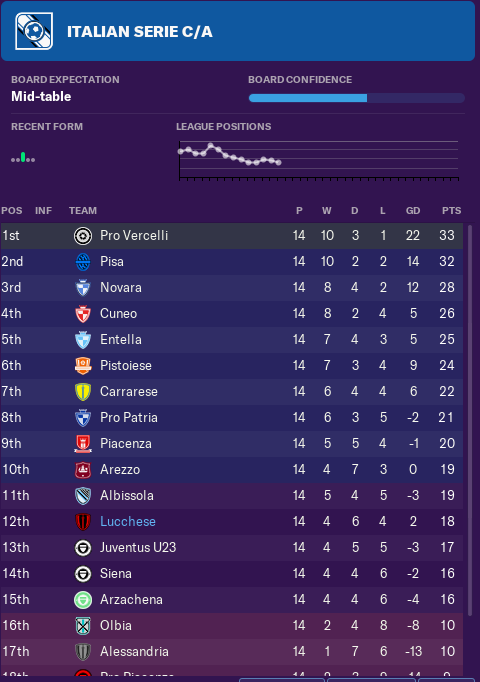 Right now I am focused on our playoff games and then once those are complete we will turn our focus to next season; whether that is in Serie B or attempting to get out of Serie C again. Will Lucchese win promotion? Let me know your opinion as we prepare for the toughest part of the season. Good read so far. Just curious why your job title says head coach? I've never seen that only manager? That's a great question, and honestly I have no clue. I wonder if it has anything to do with having a director of football? Glad you're enjoying the read and hopefully I will have some good news to share in the next update! 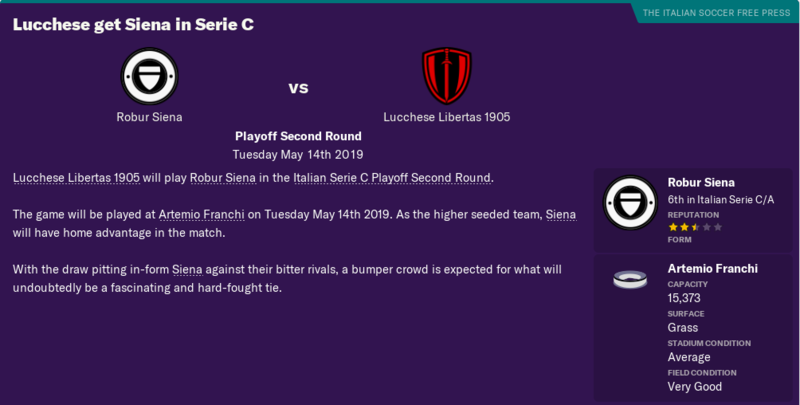 The Serie C playoff results are in and I am excited to get this post going and looking forward to next season. 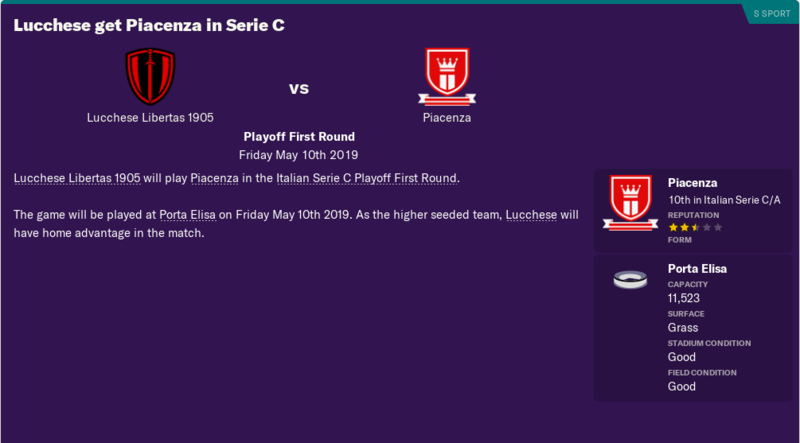 Our first round avversario for the Serie C playoff is Piacenza, and if you remember correctly, this is the same team that knocked us out of the Serie C Cup semi finals. I personally want to knock these guys out because of that loss we took in the Serie C Cup. I have to make sure the squad is focused and we are ready to go because there is no telling what next year brings and if we can gain promotion this season I would be extremely pleased. In what I thought was the first leg of two we were able to get a goal before half which gave us the lead but I still wasn't comfortable going into the second half. I knew we needed a second goal and was hoping that we would be able to find some inspiration from somewhere, or someone. 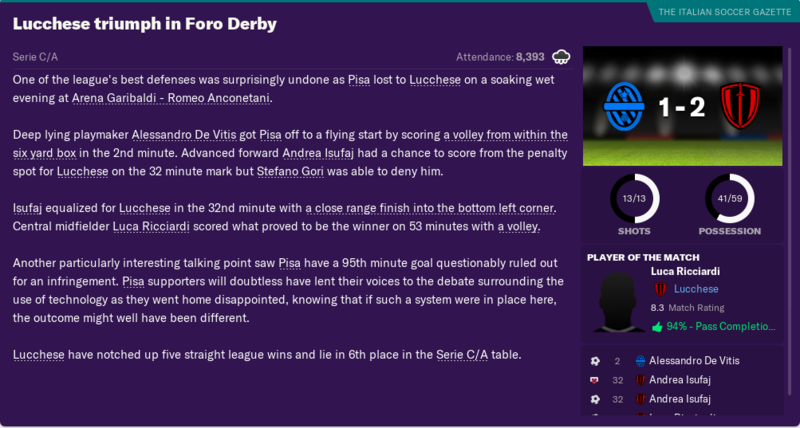 Early in the second half we gave up a goal and we were knotted at 1-1 and as the time continued to tick away, in my mind I knew that Piacenza had gotten the better of us because they had secured the away goal. When the match finished 1-1 I thought immediately after of the disappointment of not being able to grab a win at home and knew it would be a tall order against a team that has seemed to have our number this season. When I left the stadium that night I was trying to put it all together on how we could have been better, and what we would have to do to overturn this away goal deficit. To my surprise when I woke up the next morning I saw an interesting headline which made me extremely excited. 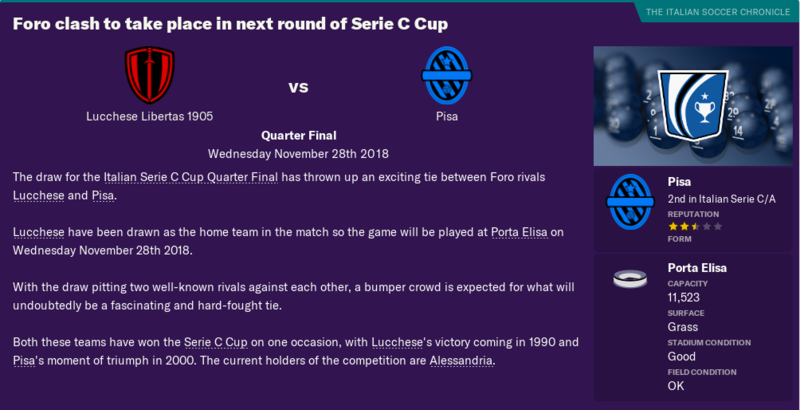 Its a quirky rule that happens in the Serie C playoffs and for once we've got one in our favor. After the first round scare we were drawn with one of our rivals Siena. Other than Pisa who is our most direct rival, I would say that Siena is most likely our second closest rival. This would truly mean something for the fans if we were able to pull off a victory and advance to the next round. 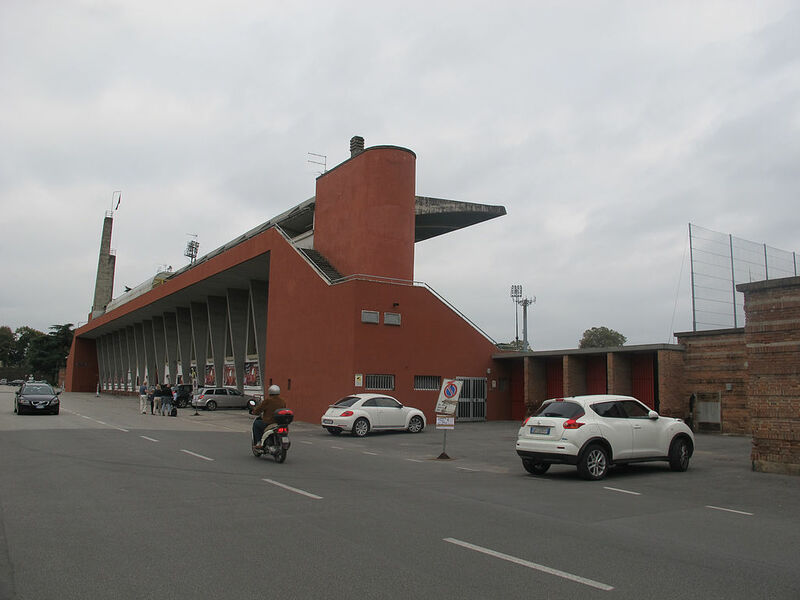 We would play away this game and surprisingly enough at the Artemio Franchi, Fiorentina's home stadium. We made our trip to Siena and went down 1-0 in the 41st minute. At half time I encouraged the players to get going and needed them to give me a response, unfortunately it wasn't meant to be at we went down 2-0 in the 51st minute. I knew it was time to change some personnel and started making some subs, trying anything to get these guys going. In the 70th minute I started changing tactics and taking off defenders for attackers and pushing players forward. In the 74th minute we got a goal back through Matteo Gabbia, and as we inched closer to the 90th minute I continued to throw players forward. In the 94th minute we drew level with a goal from Isufaj who had been fairly quiet during the end of the season. With it being 2-2 and assuming that we would be kicked out because of the strange rule that we were introduced to last round I pressed forward more and kept my fingers crossed it would pay off. 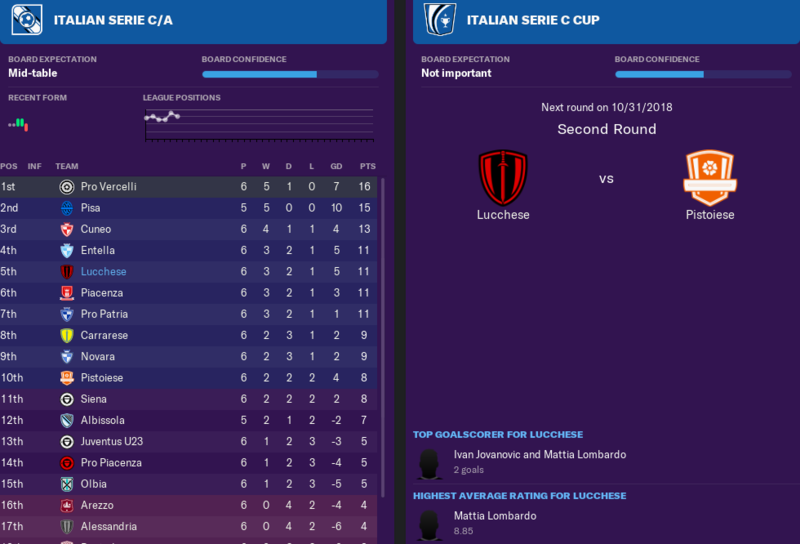 Unfortunately it wasn't enough in the end but after completing my first season with Lucchese, I have to say I am impressed with how we played. Some tactical changes throughout the season did us a lot of good and I am looking forward to next season. We have a lot of players in on loan so I will have to work hard to secure a good squad for next season. 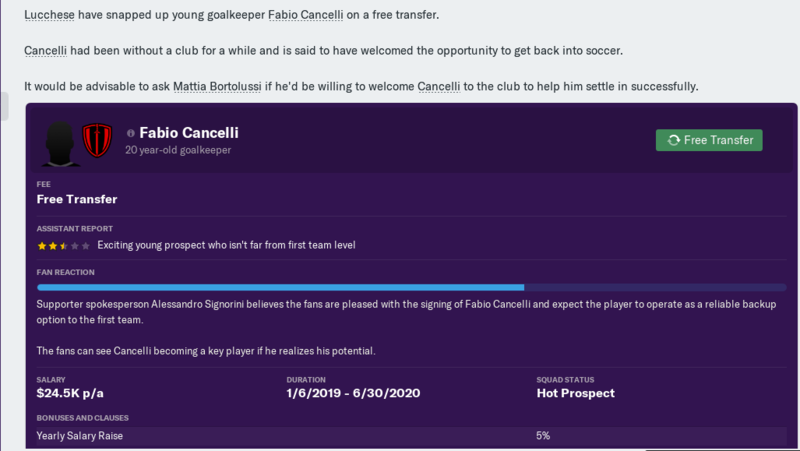 I will look to keep Falcone and Gabbia as they were two of my best players in on loan and hopefully we can make a push for playoffs and promotion again next season.